The Hokkien School is a unique mix of European, Indian and Malay architecture. KUCHING: Though smack in the city centre not many people know of the existence of a very historical building, The Hokkien School, which is a hybrid of European, Indian and Malay architecture. 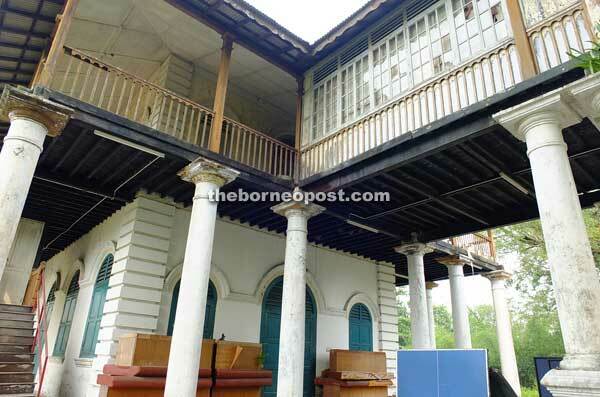 President of Sarawak Heritage Society (SHS) Karen Shepherd said apart from being a landmark of Chinese education here, the building was made from local materials. “It’s a beautiful, elegant building and the last remaining original Chinese school in Kuching. 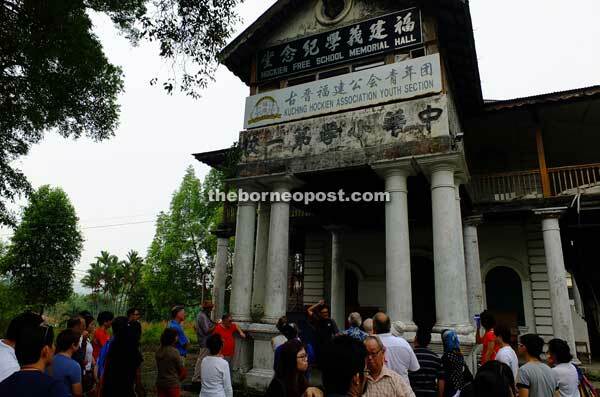 The society hopes to see it restored as the architechture is unique and was used as part of the school (Chung Hua Primary School 1),” she said at the site visit with members of Pertubuhan Akitek Malaysia Sarawak Chapter (PAMSC) yesterday. Though not open to the public, she hoped that more city folk would know the history of Kuching and be proud of their heritage. The site visit was aimed at raising awareness on Sarawak heritage for the society, and as part of PAMSC’s process of Continuing Professional Development for its members. She added the building, owned by Hokkien Association, was still in use up to the 70s. Close to 50 people turned up for the site visit although 20 was targeted. They were treated to a sharing of the history of the site and architectural significance of the building by PAMSC president Mike Boon. The building itself is both culturally and architecturally significant. Culturally, it represents a milestone in the educational and social development of the Chinese in Sarawak, and in particular the Hokkiens. The Hokkien School is the first brick-and-purpose-built school building dedicated to Chinese education in early Kuching. The early settlers, faced with the struggle to survive were unable to prioritise education for their children. The Brooke government had to subsidise Chinese schools through the mission, but in 1911, the (Hokkien) clan took matters into its own control, set up the school along with the first of five tuition centres in a shophouse next to St Mary’s School, said Boon. “This was made possible by cooperation of the Hokkien Association, set up in 1871 under Ong Ewe Hai, the owner and guardian of this significant heritage property. It is familiar to many Kuching residents and in particular, alumni of Chung Hua Primary School 1,” Boon said when met yesterday. The date of its founding had special meaning. It was the year in which the last Chinese dynasty — Qing dynasty — was falling in China, just as a new phase in Chinese education was rising in Sarawak, he added. Built in brick, the building suggests the rising socio-economic status of the clan but originally had a belian shingle roof. The very founding of the school also supports this, showing a greater emphasis on education among the Chinese as well as a desire to maintain their cultural links in an educational system separate from that offered by the Brookes. The medium of instruction was originally split between Chinese and English, Boon said. The original Chinese school in Sarawak is made with bricks and wood.